Yu-Gi-Oh! The Dark Side of Dimensions Blu-ray and Digital HD cover. After being screened at theatres across Canada and the United States earlier this year, Yu-Gi-Oh! The Dark Side of Dimensions is now on its way to Blu-ray and DVD on June 27th, 2017. With a story written by mangaka Kazuki Takahashi, Yu-Gi-Oh! The Dark Side of Dimensions sees the return of Yugi Muto with his pals Joey Wheeler, Tristan Taylor, Téa Gardner, and Bakura, along with the egotistical Seto Kaiba. From another dimension comes a boy intent on challenging the Pharaoh Atem by befriending Yugi. With lost pieces of the Millennium Puzzle finally acquired, Yugi must fight to save his life and those of his friends. One card is all it takes to change the tide of battle. It’s game on! Yu-Gi-Oh! The Dark Side of Dimensions is coming to Landmark Cinema locations across Canada. It’s also being shown in US theatres as well, but only for a two-week period between Friday, January 27th through Thursday, February 9th, 2017. Exact Canadian dates were not made available. With a story written by mangaka Kazuki Takahashi, Yu-Gi-Oh! 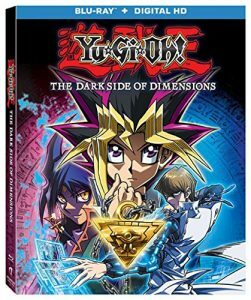 The Dark Side of Dimensions sees the return of Yugi Muto with his pals Joey Wheeler, Tristan Taylor, Téa Gardner, and Bakura, along with the egotistical Seto Kaiba. One card is all it takes to change the tide of battle. It’s game on! While the movie promoter has a list of available Landmark Cinemas locations, the theatre chain’s own web site makes no mention of the title at time of writing. Yu-Gi-Oh! The Dark Side of Dimensions premiered in Japanese theatres in April 2016. Did you know that you can pick up a comic book for free on Saturday, May 2nd, 2015? Free Comic Book Day occurs on the first Saturday of May where participating comic stores let fans pick up an eligible book for free. This year, there’s some manga sidling up close to classics like The Avengers and Captain Canuck. There’s also spin-offs from popular televised series including Bob’s Burgers, The Simpsons and Doctor Who. Pokémon by Hidenori Kusaka from Perfect Square. JoJo’s Bizarre Adventure by Hirohiko Araki and Yu-Gi-Oh! by Kazuki Takahashi from Viz Media. Attack on Titan by Hajime Isayama from Kodansha Comics. Sonic The Hedgehog and Mega Man Worlds Unite by Ian Flynn, Gary Martin and Evan Stanley from Archie Comic Publications. For a complete list of available titles and participating store locations, visit the Free Comic Book Day web site. It’s no surprise that popular anime series have inspired various styles of merchandise, but skateboards? Yes, there are boards out on the street with a ninja design or a monster. 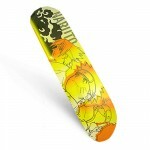 Viz Media had 400 custom-made, limited edition Naruto skateboard decks available for sale on their web site. Of the 400 boards manufactured, 200 were a yellowish base highlighted by an outline of Sasuke, Naruto and Kakashi with “NARUTO” written in the top corner. The remaining 200 featured Gaara in a stance on a brick red background along with his name in the corner. The Yu-Gi-Oh! craze also spurred a variety of skateboards that featured the main character Yugi Mutou with a few creatures from his card deck. These decks (no pun intended) also came with their own trucks and wheels, with the latter often displaying the logo from the series along the edges. There are a few other series that have boards out there, including Digimon, Bakugan and Pokemon. Just remember that these decks are aimed at a younger generation and may not stand up to the tricks of more serious riders.